Match (2014) – What's New on Netflix Canada Today! As a Juilliard professor is interviewed by a woman and her husband for her dissertation on the history of dance in 1960s New York, it becomes increasingly clear that there are ulterior motives to the couple’s visit. 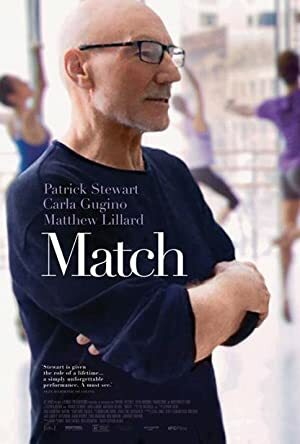 Tobi Powell (Patrick Stewart), an aging Juilliard dance professor with a colorful and international past, is interviewed by a woman and her husband (Carla Gugino & Matthew Lillard) for a dissertation she’s writing about the history of dance in New York in the 1960’s. As the interview proceeds, it becomes increasingly clear that there are ulterior motives to the couple’s visit. Explosive revelation is followed by questions about truth versus belief. MATCH is a story about responsibility, artistic commitment…and love. As a Juilliard professor is interviewed by a woman and her husband for her dissertation on the history of dance in 1960s New York City, it becomes increasingly clear that there are ulterior motives to the couple's visit.